Thanks to all those who sent messages of support before, during and after the storm. 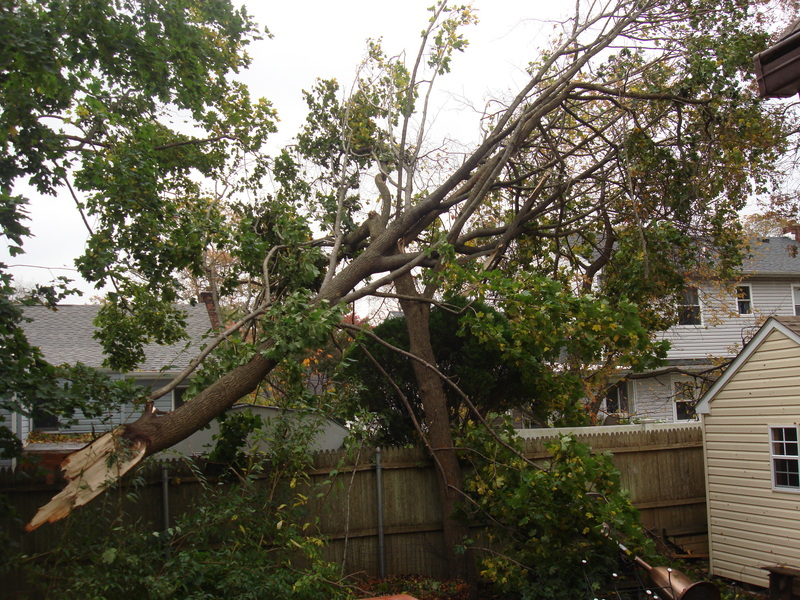 You are reading the words of someone who feels incredibly blessed; aside from losing power for a few days and a big branch down in the backyard, we came through pretty well. I was even able to attend a teaching conference in Albany (the capital of NYS) which was not affected by the storm, and present successfully with my colleagues from Thursday to Saturday; we were among the few who made it from downstate. Please lend a thought or prayer to the many who have lost lives, or homes, or peace of mind, who are still without power as the temperature drops, or don’t have clean water or food to eat. I go back to teaching tomorrow. We already know of one student in our program who lost his life. I am praying for him and his family, as well as hoping that none of our other students were so fatally affected. I have only heard from three out of my nineteen students and am very anxious for their well-being. We’ll now see how we can help. Our students are immigrants and international students; certainly we will have to help the boy’s family raise the funds to send his body home. 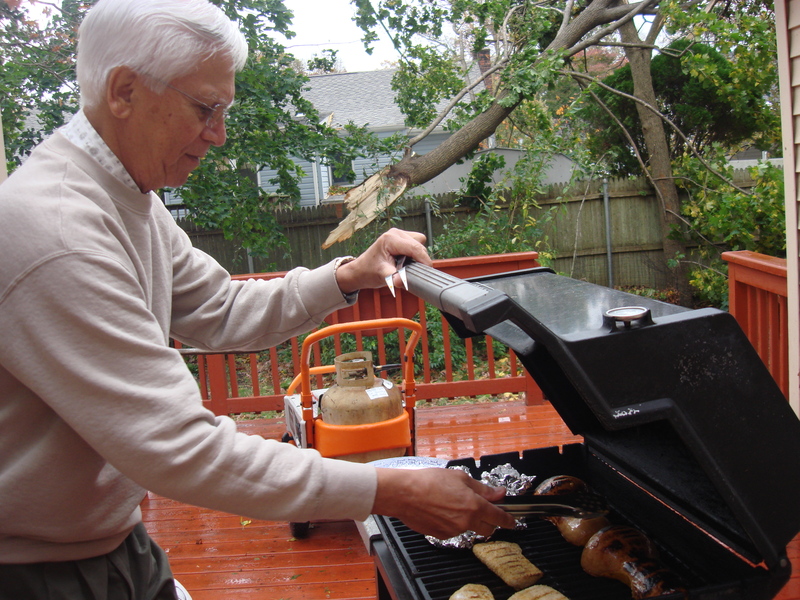 I will share with you a few images from our storm days (and a recipe) as we made the best of it and came out unscathed and feeling blessed. Padushi mans the grill (or grills manfully) against a backdrop of generator and downed branch. 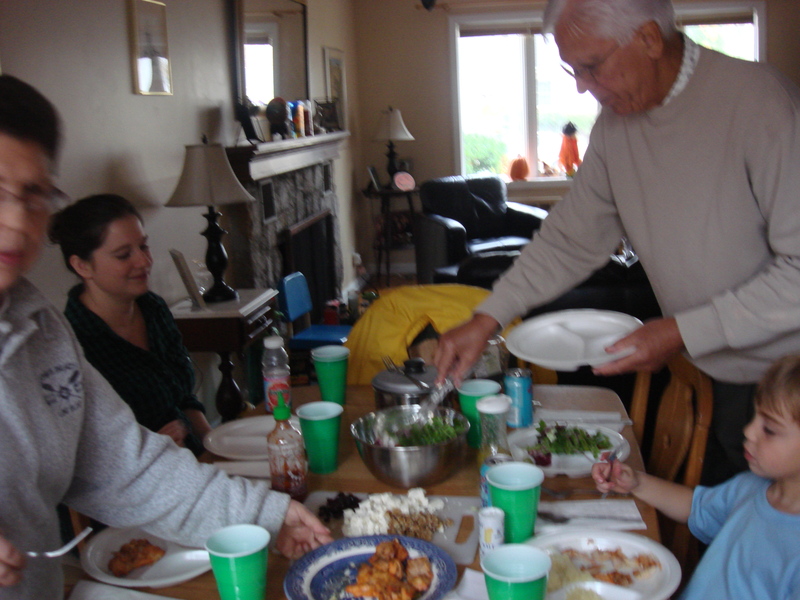 Family meal. Ashley stayed with us for the duration. I had a heritage bird from Restoration Farm in the freezer (you may ask yourself why I would freeze one rather than make it right away; I don’t have any good answer for that, but there it is) and wasn’t about to let it go off in the absence of power. So I decided that tough times call for chicken noodle soup criollo style. I took the bird out a day before the storm to defrost in the fridge. 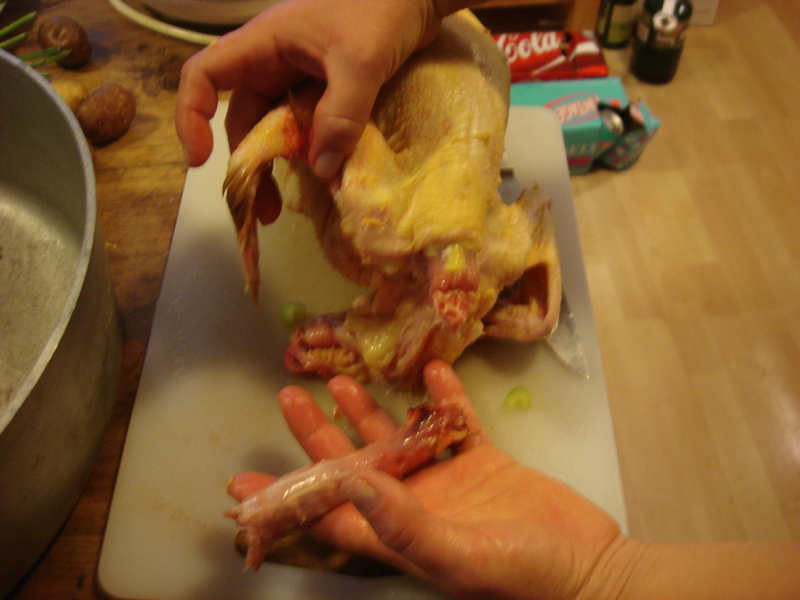 It wasn’t quite defrosted, but the cold made it easier to remove the skin. The directions say to simmer for an hour, but really, I just simmered until we lost power, then we turned on the lanterns and lamps and served up. It was a good way to steel ourselves for the onslaught (which was ferocious) and we were able to heat some up the following day for comfort! 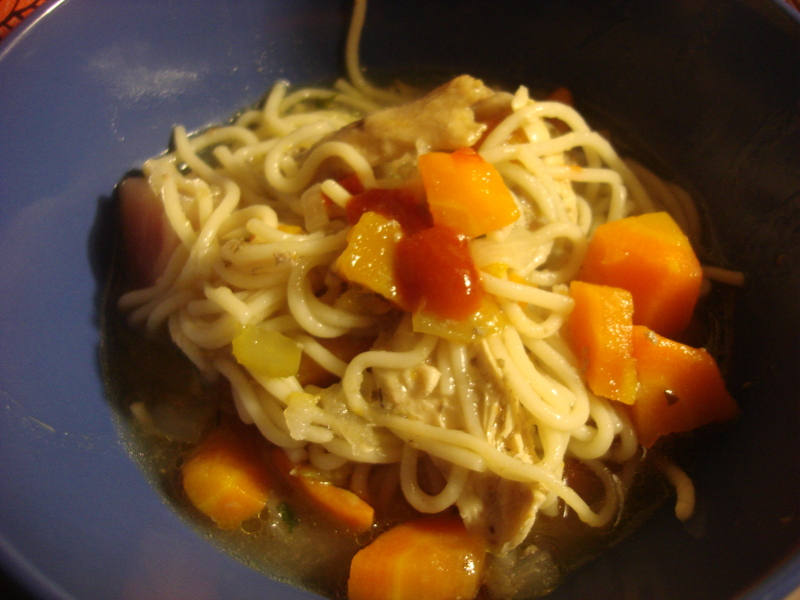 Sopa de pollo y fideos (Chicken noodle soup). Lots of noodles for the littles! A dab of sriracha for the bigs. Place all ingredients EXCEPT noodles in a big pot. 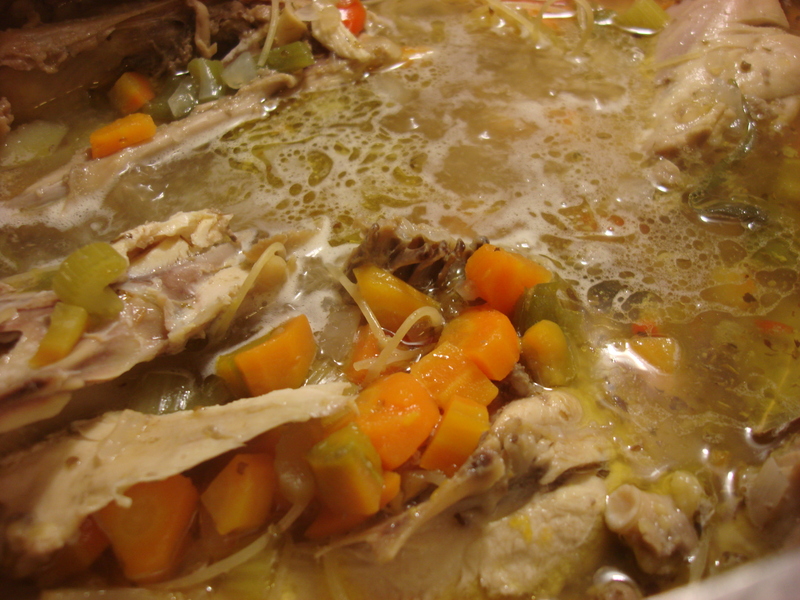 Bring to a boil, then lower to a lively simmer and cook at least until chicken is cooked through, but preferably for at least an hour so the meat is falling off the bones. Add noodles five to ten minutes before serving. natalia… i am so relieved and thankful to know that you and your familia are safe/well. conversely, i am very sorry to hear of the tragic death of your student; may he rest in peace. please keep us posted if there is a fund and/or any way we might be able to assist his family/friends. they are seeking relief funds (there are a number of ways to donate), housing help, and volunteers for clean up/rebuilding efforts. there is help and information for residents. there are two fundraisers coming up on the 30th of november and the 1st of december. i was just informed about the site and have not yet had a chance to do anything beyond passing this information to you and your readers. please excuse me for going “off-topic” but when i read what you wrote it seemed the right time/place. Me alegro mucho de que estéis bien Natalia y de que Sandy no haya causado demasiados desastres en tu casa. Por lo visto supiste aprovechar lo que tenías en casa de una manera magnífica. Espero que pronto la vida vuelva a la normalidad. Glad you came through all right. This looks like a wonderful way to get a little comfort food. It was very comforting indeed to have a taste of Puerto Rico…where I have spent half a dozen hurricanes…keeping me warm through this one. I am very happy you are okay and I hope no more bad news will come your way. The delay in restoring power is a lot longer than I expected it. The closest I came to a natural disaster was the blizzard we got a few years ago in Chicago, but thankfully I made it home okay that day and didn’t lose power. Sandy has made realize how lucky we were in Chicago! Thanks so much for the good thoughts. We need them! A very difficult time for so many of you. Very glad you got through. So many people that I know in NY and NJ have come through on the right side of Sandy. What strikes me about it is the incredible spirit shown by so many in the face of such adversity. Thanks for the good thoughts, Conor. Lots of indomitable spirit out there. Glad to hear you’re safe! So sorry to hear about the student in your program. Soup sounds delicious! Thanks for the concern! It’s been a devastating storm. That sounds like an excellent sustaining soup to get you through the storm.